Lung cancer is the most preventable malignancy globally. However, it is the deadliest form of cancer with very high mortality rates. Murine models are instrumental in preclinical research for studying novel therapeutic agents and treating human cancer. The tumorigenic and weakly metastatic LL/2 cell line was isolated in 1985 from tumor cells of a mouse with a Lewis lung carcinoma. The cells are hypotetraploid, have a 72 modal chromosome number (Dus et al.). A 2010 study by Yang et al. published in Cancer Cell investigated the BMK-mediated inhibition of the tumor suppressor activity of promyelocytic leukemia protein (PML) in tumor cells. A small-molecule inhibitor of the kinase activity of BMK1, XMD8-92, blocks tumor cell proliferation in vitro and significantly inhibits tumor growth in the LL/2 xenograft model in vivo, demonstrating the efficacy and tolerability of BMK1-targeted cancer treatment in mice. A 2018 study by Chen et al. used the LL/2 xenograft model to analyze the effects of a protein-bound polysaccharide (antrodan) derived from fungal mycelia of Antrodia cinnamomea when combined with Cisplatin. Results showed that this combination treatment had a number of positive results including: inhibition of plasma urokinase plasminogen activator (uPA), inhibition of p38 and ERK2, decreased kidney dysfunction induced by cisplatin (decreased blood urea nitrogen (BUN)), reduced signal transducer and activator of transcription 3 (STAT3), inhibition of mitogen-activated protein kinases (MAPKs) and JNK and an immunomodulation-mediated anti-metastasis response. Finally, a 2012 study in Journal of Cancer by Yan et al. used LL/2 cells to examine toxicity of curcumin, an anti-inflammatory agent, on lung carcinoma. It has been reported that curcumin exhibits phototoxicity and selectively kills tumor cells; this study confirmed this phenomenon and was the first to show that curcumin treatment results in subpopulations with minimized aggression. The LL/2 cell line (mouse lung; Lewis lung carcinoma) is used to create the CDX (Cell Line Derived Xenograft) LL/2 xenograft mouse model. The LL/2 xenograft model, known to be resistant to BCNU, enables anti-tumor growth studies such as those studying inhibitors of BMK1 (e.g. XMD8-92). All tissue culture flasks are maintained aseptically at exponential cell growth. LL/2 cells are collected with trypsin-EDTA. Percentage of viable cells is determined via trypan blue exclusion. In a volume of 100 µL, 1 x 106 cells (Matrigel plus LL/2 cells) are subcutaneously injected into C57BL mice (10-12 weeks old). Injection site tumor development is continually monitored and digital calipers are utilized until tumors reach 50-150 mm3. Test compounds are administered to the study groups following the dosing schedule. Daily tumor measurements are logged and mouse body weights recorded 3 times a week. Maximum tumor size limits marks the end of the in-life portion of the study. As defined in the study design, a necropsy is performed. Tumor excision and weights are documented and then imaged. At the client’s instruction, tissues can be fixed in 10% NBF, snap frozen or stabilized in RNAlater. 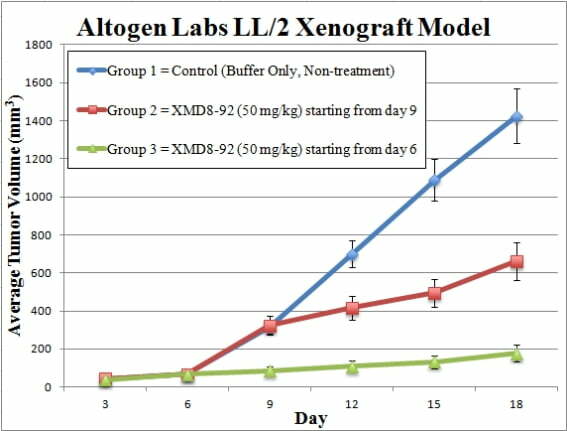 Xenograft animal models are used to assess the effectiveness of experimental test compounds against specific types of cancer. New medicines are tested on staged tumor growths that have been engrafted via subcutaneous or orthotopic inoculation in an immunocompromised NOD/SCID mouse or rat model. All clinically approved anti-cancer agents have been evaluated with conventional preclinical in vivo models. Xenograft studies can be highly complex, starting with the selection of the appropriate animal model, choice of tumorigenic cell line, administration method, dosing, analysis of tumor growth rates and tumor analysis (histology, mRNA and protein expression levels). Animal handling and maintenance at the Altogen Labs facilities are IACUC-regulated and GLP-compliant. Following acclimatization to the vivarium environment, mice are sorted according to body mass. The animals are examined daily for tumor appearance and clinical signs. We provide detailed experimental procedures, health reports and data (all-inclusive report is provided to the client that includes methods, results, discussion and raw data along with statistical analysis). Additional services available include collection of tissue, histology, isolation of total protein or RNA and analysis of gene expression. Our animal facilities have the flexibility to use specialized food or water systems for inducible gene expression systems.